Why does this trompe l’oeil architectural model that is also a bird house have anything to do with night clubs? It was a wonderful present to Bobby Short in honor of his many years crooning at the Café Carlyle in the Carlyle Hotel. It combines the artistic talent of Richard Haas, an unknown model maker, and a sense of whimsy to produce the tower of the Carlyle Hotel, home to the Café Carlyle and Bemelman’s bar. The glamour of the people and associations with the building make it doubly charming that it was rendered as a birdcage unlikely to ever house real birds. Perhaps the allusion was to the ultimate songbird Bobby Short. There is a presentation paper on the bottom that says: Presentation paper on bottom: “The Carlyle Hotel/ Painted by Richard Haas /Presented to Bobby Short /2002”. This was 34 years after his first evening of song there in 1968, and three years before Short’s death. What is also important is that Haas, with his trompe l’oeil painting style, turned this from being a generic model, made of common materials, of painted wood, like so many birdcages, into a precise architectural rendition of the tower of the Carlyle. Connecting architecture to birdcages and birdhouses has been a repeated theme for collectors of both models and birdcages. In Cooper Hewitt’s collection, there is a cast-iron birdhouse model of a Gothic-style cottage, Clifton in Roslyn New York, patented in 1868 birdcage model based on a church in Flushing Queens rendered in wood of what is now a stone-covered church of the same form. This makes sense, as the open spaces between the wood slats on that one, make it possible to see the birds inside what is otherwise an architectural model of a church. The Bobby Short bird house, clearly suggests that, like the Café Carlyle, those on the outside could only see the building, but he was singing inside-more suitable for a nest –a house- than for viewing the birds in a cage. Another architectural birdcage in the collection is one in the form of the Rialto Bridge in Venice. Here wirework keeps the birds in but enables the viewers to see the birds. Perhaps a pleasant reminder of travels to Venice, the birdcage reflected the place and the desire to capture a bit of entertainment. As most of us cannot collect buildings, or at least famous ones, the architectural model makes the love of architecture a collectible pursuit. While birds should be free spirits, birdcages remind us of how people like to collect something that cannot be well tamed-the songbird; the more exotic the bird the more specially thought out their housing should be. The bird house does not suggest captivity and what better ode to the entertainment of song, than a memento of a place devoted to song, given to one of the longest-standing songsters in it-without a bird in sight! Who needs birds if you could sing the way he did? It lives on as an architectural model with its own artistic expression, and maybe if you listen carefully you will hear the romantic patter of Bobby Short in the Café Carlyle. 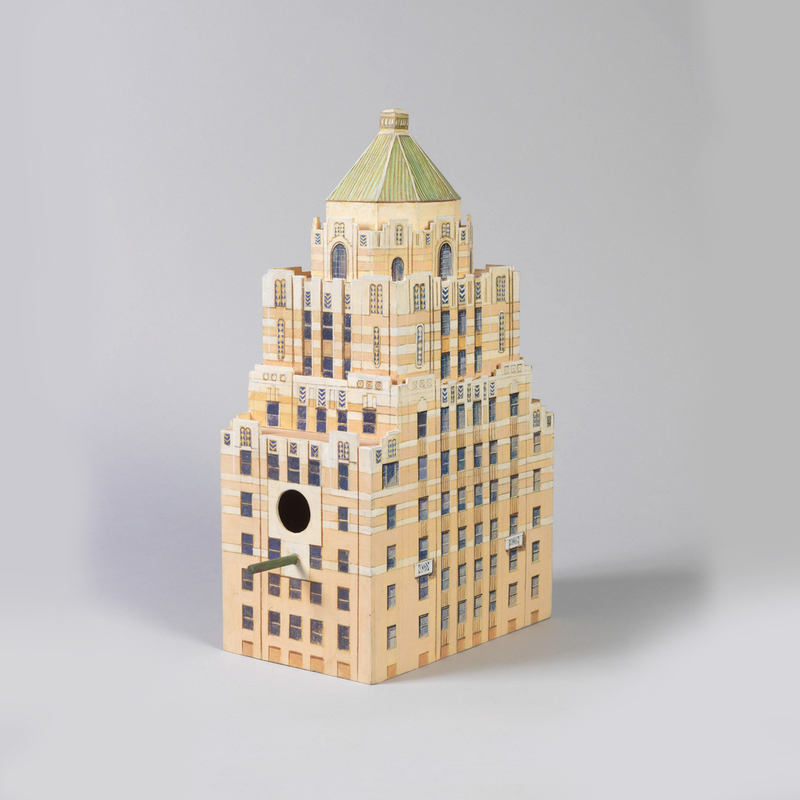 Carlyle Hotel Birdhouse Model, Painted by Richard Haas (American, b.1936), New York, NY, USA, 2002. wood, paint. Gift of Eugene V. and Clare E. Thaw. 2013-3-7.